Is Ed Tech Investment Slipping? The Forbes 30 under 30 confers celebrity status to a bunch of twentysomethings in more than a dozen fields — including education. Many of them are trying to get rich at the public trough by selling educational software and high-tech tools to schools. But what caught my eye was a tally of investment dollars going into start-up education technology companies. If we were really in boom times, you’d expect that number to be going up. Instead, investor enthusiasm for high-tech education seems to be diminishing. 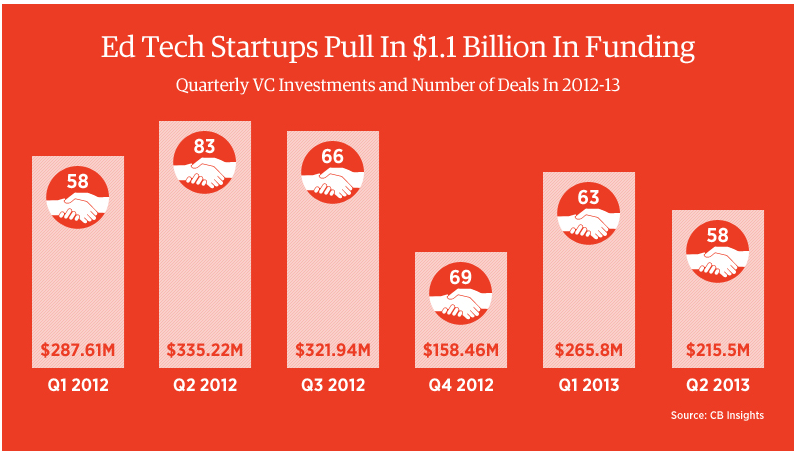 Of course, you shouldn’t read too much into quarterly venture capital figures. One outsized deal can skew the numbers. But it will be interesting to check back again later this year.